The tourist center in Dazu, Tongnan, Tongliang, and Bishan counties offers the visitor a chance to view the art of stone sculptures from the Tang (618- 907) through to the Song Dynasty. They are in Dazu County, where 76 caves house more than 60,000 statues and more than 100,000 Chinese characters carved on the stone walls, including those on the Northern and Baoding mountains, which are the largest in scale, the richest in concent, the bestpreserved, and most exquisitely carved. They are to be found on Northern Maintain two kilometers From the Dazu County seat. Statue carving began in 892 and lasted for nore than 250 years. The statues are concentrated on precipices that form a gallery of 500 meters long and 4-7 meters high in the form of a half moon at Fowan. There are altogether 290 caves enshrining almost 10,000 statues. Each cave has a style of its own, and all the statues are beautifully shaped and exquisitely carved. Built on Baoding Mountain 1 5 kilometers forth of the Dazu County seat, the temple is closely related to ston sculptures on the mountain. 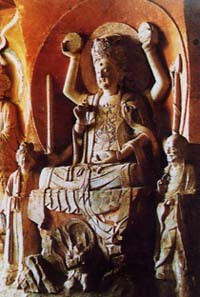 Its main structures include the Tianwang (Heavenly King) Temple, the Yuhuang (Jade Emperor) Temple, and the Mahavira Hall. The imposing temple features tiers of eaves and exquisite carvings. On Nanyan (South Crag) by the temple stands the Wansui (Longevity) Tower. It is an octagonal structure with four tiers of eaves and carved figures from ancient stories. Towering north of the Dazu County seat, the pagoda was guilt during the reign of Emperor Gao Zong (1131-1162) of the Southern Song Dynasty. It is a seven-story structure more than 30 meters high, and the edge is three meters across. A passage inside leads to the top. The exterior is embellished with carved bricks forming more than 100 designs. The ' interior is decorated with statues that ` are exquisitely carved and rare to come by elsewhere.